Simple white shorts and string bikini top, with black star jewel embellishments. Basic white leg warmers. I found the shoes online, and the black star belt at Walmart (believe it or not). 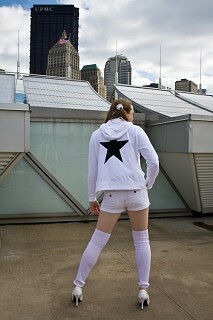 Used an iron-on transfer to attach black stars cut from a bandanna to a basic white hoodie. Eye flame was created with red eye makeup.